The number of companies that want to drill in new Barents Sea acreage is dwindling. As Statoil on Tuesday presented its development plans for Johan Castberg, the oil field in the Barents Sea, the Norwegian Ministry of Petroleum and Energy released its list of bidders for the country’s next 24th license round. The oil industry cheered over Statoil’s €5 billion investment in the Johan Castberg, and regional oil and gas association Petro Arctic announced that «this is the new golden coast of Norway». Meanwhile, the list from the ministry reveals that only 11 companies want to take part in the 24th round, the historical opening of new Arctic areas to oil drilling. It is a reduction of more than 50 percent from the previous 23rd license round in 2015. Then, 26 companies submitted bids for the total of 57 northern blocks on offer. The new list includes most of the companies which from before are represented in the region, among them Statoil, Lundin, AkerBP, OMV and DEA. Also Shell and RN Nordic, a subsidiary of Russia’s Rosneft, are on the list. The companies have all submitted bids for the Ministry’s announced 102 new blocks in northern waters, and licenses are due to be awarded before summer 2018. The oil companies’ falling interest in the Barents Sea comes after several unsuccessful well drillings in the area. Despite high expectations and a historical high number of wells, the companies made no major new discoveries in 2017. In addition comes a growing concern over the actual revenues which can be expected from the new Arctic projects. Statoil argues that its Johan Castberg will be profitable at an oil price of about $35 per barrel, but doubts have been cast over the Goliat project, the oil project which came into production in 2015. According to Professor of petroleum economics Knut Einar Rosendahl, «there is a high probability that Goliat will have a negative present value when the field is shut down». Minister of Petroleum and Energy Terje Søviknes, meanwhile, maintains that the Norwegian state will make about 13 billion NOK from the Goliat. However that estimate includes an oil price up to $60 per barre, he told newspaper E24. The scandal-ridden Goliat project has since its launch been haunted by technical problems and production has been halted repeatedly. Meanwhile, many local authorities and industry representatives in northern Norway continue to pin their hopes for the future to Arctic oil. According to Petro Arctic, the Johan Castberg project is «one of the world’s biggest industrial projects», which will generate «several hundred new jobs». The 24th license round was presented to the industry in June this year. “New exploration acreage is vital for our jobs and economy,” Minister Søviknes underlined as he presented the call in June this year. 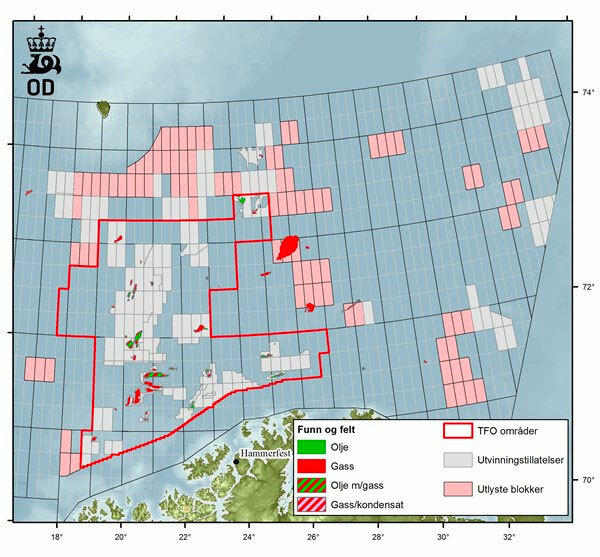 Included are 102 new blocks, of which 93 will be in the Barents Sea. Ten of the new blocks are located north of the 74th parallel. Another 12 blocks are located off the coast of East Finnmark, the Norwegian Arctic mainland. Never before had Norway with such a magnitude welcomed the oil industry into its Arctic waters.